The Cottage in the Wood017687 78409work Restaurant with RoomsThe Cottage in the Wood Country Hotel and restaurant is a former 17thC coaching inn situated in the heart of the Whinlatter forest near Keswick, in one of the most beautiful and dramatic areas of the Lake District National Park. The Cottage in the Wood is five miles from Keswick in an area of the Lake District National Park that inspired the famous author and fell walker, A W Wainwright to write ‘that the North Western fells are the most delectable of them all’. The hotel provides a peaceful and tranquil location, yet is only ten minutes drive from the bustling market town of Keswick. We are ideally situated between the lakes of Bassenthwaite, Derwentwater, Buttermere and Crummock Water. The Cottage in the Wood sometimes limits bookings to 2 or more days. 8 Garden Room sometimes limits bookings to 3 or more days. Loft room with king size bed, spacious bathroom with roll top bath and separate shower. Tree top view with amazing night sky on clear nights. 9 Tree Tops sometimes limits bookings to 3 or more days. The Cottage in the Wood Country Hotel and restaurant is a former 17thC coaching inn situated in the heart of the Whinlatter forest near Keswick, in one of the most beautiful and dramatic areas of the Lake District National Park. Stunning location at the top of Whinlatter Pass with superb views down the valley toward the Skiddaw mountain range. Peaceful setting surrounded by forest and close to the Whinlatter visitors centre and Osprey project. Close proximity to Derwentwater, Bassenthwaite, Buttermere, Crummock Water and Loweswater.Only children Children welcome from age 10. Leave M6 at jct 40 for A66 Cockermouth/Keswick. Take B5292 just past Keswick signposted Braithwaite/Lorton via Whinlatter Pass. 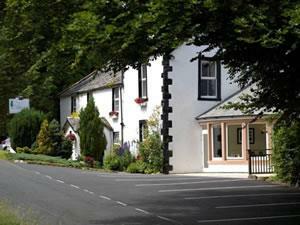 The hotel is situated 2 miles beyond Braithwaite just before the forestry visitors centre.